Beat 5 starts below Raven’s Rock. This is an excellent beat for fresh run fish, easily reaching here off the tide in reasonable water levels. From the top of the beat the river tumbles down through a long cascade, then through a series of good pools including Jäger, a great low water pool, fished from the left bank to Aggie's Bridge; one of the best high water pools on Novar. Below Aggie's Bridge there is a small pot, and below that the beat continues with a succession of pools fished from the right bank that run alongside the estate access road. This pool sequence continues for about a kilometre down to the ‘New Bridge’ on the B9176 Evanton - Bonar Bridge road. On the upper half of this section, Boulder Rush and the Ash pool will often produce a grilse. On the lower half, the Upper and Lower Robertsons, the Crag and Rush are all extremely productive. 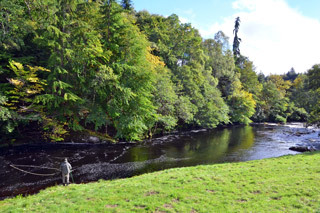 Below the road bridge there are 3 pools fished from the left bank by crossing the bridge; Lower Dalneich Bridge is another great high water pool, and the Island pool, which is reachable in all but the highest spates is fast, a great 'resting' pool to find a running fish. 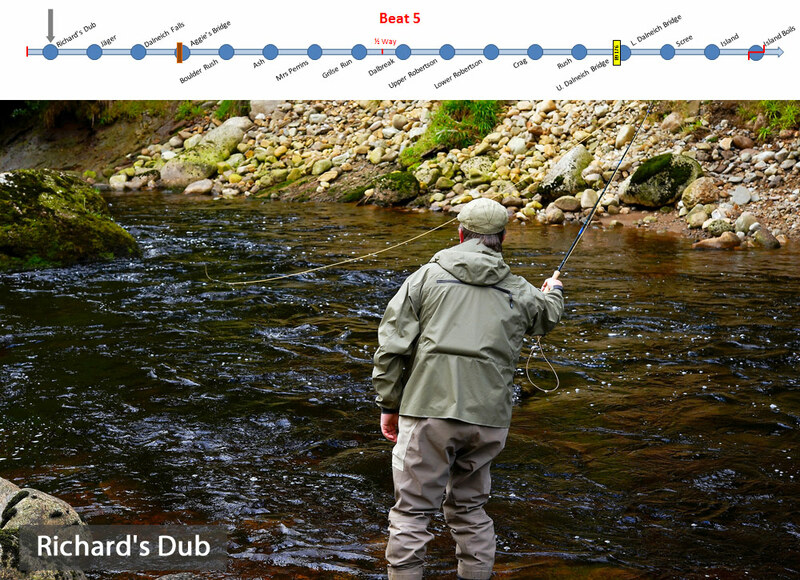 Beat 5 is the best of the lower beats in a big spate as Aggie's, the Crag and Lower Dalneich Bridge can all produce fish in very high water. * The images of Richard's Dub, Ash, Mrs Perrins and Rush above have been provided courtesy of Trout & Salmon magazine, and were photographed by Peter Gathercole. A big thank you to Peter & Andrew Flitcroft. We are slowly building an archive of video clips from each of the Novar beats. Click on the links below to see videos from Beat 5 on the SalmonQuestTV channel on YouTube. Each video will open in a new tab. Some of the shorter videos clips just comprise a brief tour of a pool; others include action footage of our guests playing and landing fish - enjoy! All videos are in HD and best viewed in full screen at 720p or 1080p HD setting. Follow Novar Beat 5 Photos on Pinterest.